. Knit So Simple: Ready for spring? Based on the vast amounts of yellow dust that seemed to permeate every square inch of life this past weekend, I'd say that Spring is most definitely here! The perpetual yellow haze that arose from the hood of my car, from the steps on my front porch and even from the dog's footprints that were tracked down my hallway from one of her many visits outside..... A pharmaceutical salesmen's jackpot for sure! But all this yellow makes me a bit giddy because I know it's just a matter of time before all of life changes - vivid hues and shades of color will soon begin to pop up and bring new life and energy to paths worn down by winter's ways. Pretty pastels are tucked just below the surface in the buds and blossoms just waiting for their cue to explode into a most grand and glorious fireworks show for everyone to enjoy! But best of all, Spring signals the celebration of Easter... time for giggles and candy, new shoes and hats to match, Easter frocks and little boys with cute plaid shorts and bow ties to match! I love watching Easter egg hunts and hearing the clacking of those plastic eggs filled with jelly beans. Chocolate bunnies and Cadberry eggs, those squishy little Peeks that leave a ring around your lips so there's no way to 'hide the evidence'. 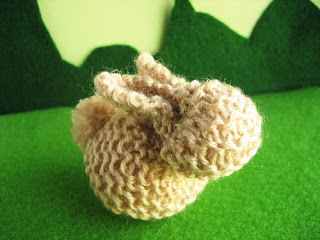 Why not include one or two of these sweet little bunnies in your little one's basket this season as well? Or better yet, surely there's a friend or two in your life that would love the smile that these are bound to bring when you set a sweet little bunny and a jelly bean filled egg beside them with a note that simply says .... Just Because! 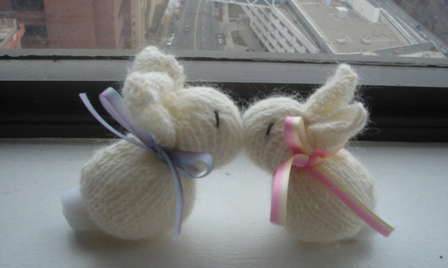 Grab some stash yarn and follow this great picture tutorial on how to make these sweet little bunnies. Time to blow off some of the pollen and spread some Spring! Easter's new beginnings are based on the promises of Hope that Christ has given each of us .... His love continues to echo through generations and civilizations, cultures and time spans that are open to receive the gift that His Love so graciously and selflessly sacrificed for each of us, so that we could spend an eternity with Him. A gift .... that is waiting to be opened. And it's with an open heart that we receive His eternal gift. A heart that is willing to be receptive to His offering, a life that applies the lessons He continues to teach, the grace that He continues to pour forth, the forgiveness that His very death demonstrated . . it's very easy to see my own life as an Easter Basket filled with all the Treats and Treasures that emanate from a relationship with Christ.